Queen’s Dance Club (QDC) is the largest student-run recreational club in Canada open to dancers of all backgrounds and abilities. QDC provides over 700 students each year with the opportunity to take dance classes throughout their time at Queen’s University. We offer 30 dance classes in a variety of styles and levels, so there is a class for everyone! Our classes run every day of the week throughout the entire school year (with the exception of public and school holidays). Getting involved in Queen’s Dance Club is a great way for students to escape from the stresses of University life and meet others with a similar passion for dance. Students in our club have the opportunity to enroll in any style of dance class they choose. Our classes range from Beginner to Advanced, to accommodate all dancers. Dancers are encouraged to register for as many dance classes as they like. Most QDC classes are choreography-based, which means that they perform in our Mid-Year and Final Recitals at the end of each school term. QDC also offers technique-focused classes that help dancers build and maintain a strong foundation in jazz and ballet. These technique classes do not perform in the recitals, as they are more focused on the dancers' personal growth. Each QDC class is one hour and fifteen minutes in length and is priced at $80.00 for the year (or $40 per semester). These final prices cover the cost of recital costumes and classes for the entire school year. At the end of each school term the QDC executive team, teachers, and club members join together to put on a final performance to showcase their talents. This will include a Mid-Year and Final Recital. All students, family members, and friends are welcome to attend our recitals and may refer to our club announcements for information regarding ticket sales. There are more ways to get involved in Queen’s Dance Club aside from taking dance classes each week. QDC fulfils their promise to provide a welcoming and supportive environment by hosting various free and low-cost social events. Some of our annual events include the Welcome BBQ, Movie Nights, and Semi Formal, among many others! All QDC dancers are also encouraged to volunteer with our Outreach team. This group helps to raise money for charity, and spreads the love of dance throughout the local Kingston community. To learn more about running dance workshops and classes with QDC's Gotta Dance! team, please visit our Outreach page. To enroll in our dance classes, Queen's University students may complete registration online via the Queen's Athletics and Recreation Centre website. Each style of dance will be allotted a registration time-slot in September. Prior to registration, it is recommended that students participate in our September Trial Week where they may attend any of our classes - free of charge! This process allows students to understand which levels and styles of classes they prefer prior to registering. Select classes with open spaces in the second semester of the school year may be available for registration in January during our Winter Registration period. Please continue to refer to our club announcements for updated information regarding QDC's registration. Inclusivity: QDC focuses on fostering an inclusive learning environment where everyone is respected and appreciated. Encouragement: At QDC we encourage students to step outside their comfort zone in a supportive, judgment-free space. Teachers and fellow club members are there to support one another and help each other grow in more ways than one. Health: QDC promotes healthy living both in terms of physical and mental health. There is no better way to stay physically active and reduce your stress level than by taking dance classes with your friends! Friendship: QDC fosters and facilitates the development of lifelong friendships both inside the studio and out. Students are bonded by their love of dance and dedication to the art! 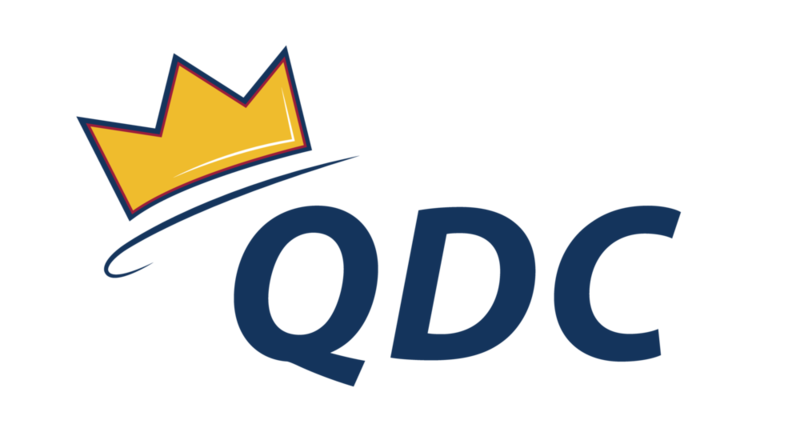 Leadership: As a club, QDC prides itself on our involvement in various outreach initiatives and being a leader in the Kingston and Queen's University communities. We'd like to thank our generous sponsors for their donations throughout the year! Check out our FAQs page or contact us if you have any more questions!